Having a lovely time at the Boat and Caravan Show at the NEC. Yesterday was press day and we launched the Batribike Micro. Waterways World Magazine was very interested and we hope to have some coverage. We have been very busy with lots of lovely people trying out the bikes in our test area. John has come along to help out and is learning all about the bikes. We hear that the magazine test of the Micro and Quartz is now on the news stands in Sailing Today. Hat hair! now what's that all about? If you're sensible and safe and wear a helmet what happens to your hair? When you take the helmet off your hair is a nightmare! If you're reckless and put your life at risk you can arrive with your hair neatly coiffed. Surely thats all the wrong way round, there should be some sort of bonus to wearing a helmet (as well as protecting your life of course!) and some sort of penalty to not wearing one so people can say look at that "should have worn a helmet"
Back in the office today after our marathon trek to Scotland, we met lots of lovely people there and enjoyed the travelling. Seeing the snow on the mountains was great because I thought we had seen the last of it here in the south, seems like I was wrong, we had what can only be described as a blizzard here today the windows actually rattled it was coming down so hard! Planning is well underway for the launch of our new super lightweight bike the Micro, we will be unveiling it at the Boat and Caravan Show at the NEC Birmingham starting on 23rd February - so not long now! We are waiting for the pre-production samples of the new and improved Diamond and Granite to come in, they should be here next week so I will be out testing again - I hope the snow goes away quickly. The journey here on Wednesday went really well, we came along the A66 from Scotch Corner across the Pennines. The sun was shiining and there was snow on the hills it looked realy nice, especially as I was all nice and warm in the van! Once we got further north the snow was gone but there was a really hard frost, even the trees were white - it was just like Christmas I felt like singing Carols, the sun was still shining so I think it must have been really cold outside. We arrived at the SECC about 2.30 and got in to unload really easily, we soon had the bikes arranged and the stand looking nice. Whilst we were in the exhibition centre it had started to snow and kept going all evening. Driving in along the river side past all the bridges on Thursday morning with the snow on the ground was a treat. 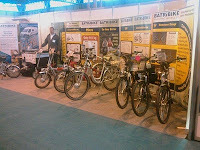 We have had two good days at the show, everyone has been very nice and we have talked to lots of people about the bikes.